Petey Perot is known as one of the greatest football players ever in Natchitoches, and ranks among the finest to pull on the purple and white at Northwestern State before becoming a well-regarded mainstay in the National Football League. 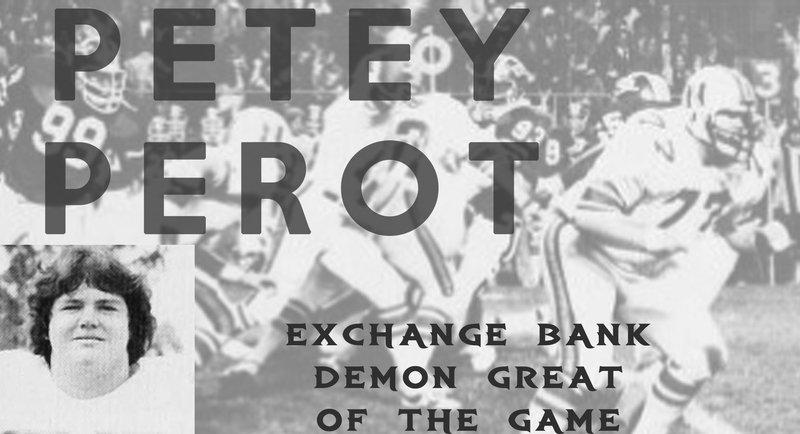 At Saturday evening’s 6:06 football game in Turpin Stadium, the NSU athletic department will recognize Perot’s career achievements as he is presented as the Exchange Bank Demon Great of the Game during the first quarter. An offensive lineman, Perot was a St. Mary’s High School All-State selection who became a second-round NFL Draft pick after an outstanding career at NSU. He started at offensive guard in Super Bowl XV for the Philadelphia Eagles. Perot was a four-year starter, mostly at tackle, for the Demons from 1975-78 under coach A.L. Williams. An All-Louisiana selection in 1977-78, Perot was the 48th player picked in the 1979 NFL draft. He played guard for eight NFL seasons as a starter in Philadelphia and New Orleans. He was noted for his consistent ability to handle Dallas Cowboys’ star defensive tackle Randy White, the future Pro Football Hall of Fame member, in classic Eagles-Cowboys contests. Perot was also Sports Illustrated’s Player of the Week for his performance with the Saints against a strong San Francisco team in 1985. A 1993 N Club Hall of Fame selection, Perot was in the spotlight last May as one of the featured Legends at NSU’s annual Legends Dinner in Bossier City. Perot was on the roster of the Top 100 Demon Football Players of All-Time selected during NSU’s 2007 football centennial celebration. He had a highly-successful career in college coaching, mostly at Louisiana Tech, where he is credited with developing Pro Football Hall of Fame member Willie Roaf. A Demon Great of the Game is spotlighted at each NSU home football game. Another former NFL player, cornerback Keith Thibodeaux, was the NSU great honored at the Sept. 3 home and season opener.